You are viewing articles tagged media. A front page article in today’s Sun Sentinel pities the poor weather reporters at local TV stations, who have to decide whether to interrupt your programming with hurricane updates or wait for the commercial. Poor babies. You know what? Wait for the frigging commercial. I don’t care how close the storm is to Bermuda. All I care about is is we are actually in a hurricane watch. It’s just not that hard. In 1988, John Dorschner wrote a long piece for Tropic, the Miami Herald’s now-defunct Sunday magazine. 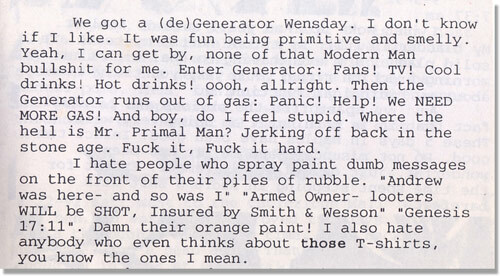 He pretended to be writing in 2008, looking back over the last 20 years. Henry Gomez dug up a copy of the magazine, and compared the predictions with what actually happened, in a 4-part series of posts. There is some very dramatic stuff here that never happened (e.g. Mariel II, 1998), but Dorschner gets a lot of stuff right. Too bad Babalu’s italicized blockquotes are so hard to read. You’ve got to love the Miami Herald. A great expose on misuse of funds at the non-profit Miami-Dade Empowerment Trust (part one of three!) runs alongside a director’s commentary style article about the reporters reporting the story. Maybe part 2 of the story will include a sidebar on the graphic designer who laid out the page. Last week, Charlie Crist’s office sent out a list of all the requests for information it had received from reporters during the previous day. Bob Norman waxes philosophical about the ethical conundrum for reporters who have this information available to scoop their colleagues. All well and good, but this is the internet dammit — I want to see the full text of the e-mail posted somewhere by the end of the day today! Update: The list is out. The Orlando Sentinel stepped up to the challenge. 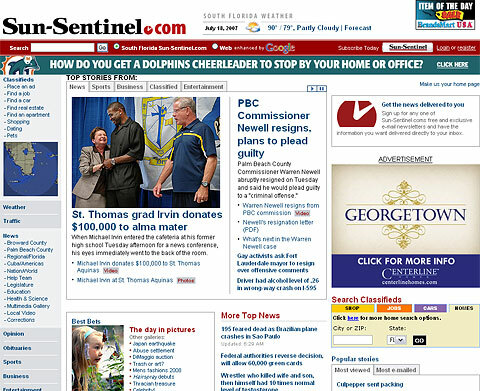 The Sun-Sentinel’s web page has been redesigned for the usefuler (obviously inspired by the fabulous nytimes.com). 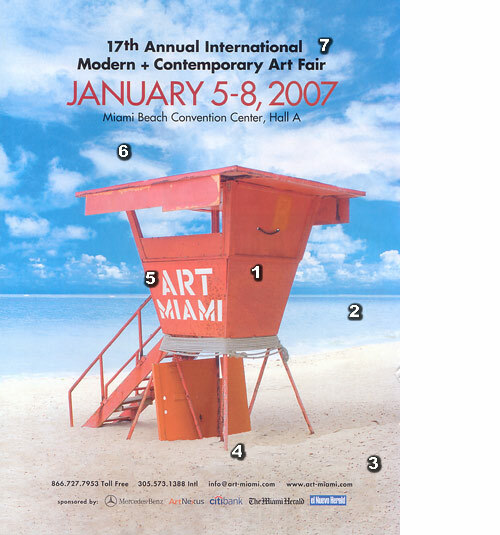 Word is that miamiherald.com is undergoing an overhaul right now, to be launched in the near future. Poor Category 305 — they’re trying so hard, but they just seem to be getting nowhere. A number of talented writers struggling in the face of an oppressive, unwieldy content management system. I mean, look at this thing: enigmatic menus along the top with enigmatic drop-downs. I’ve been clicking around this thing for the last half-hour, and I occasionally land on something that looks interesting, but never get any sense of an underlying structure. The RSS feed doesn’t work. There’s a photo “gallery” where once you finally find the photos you’re not sure why you bothered. My favorite is “Shoutout! Submit Your Story,” a prominent link on every single page. I’m game, so I click. “You are not authorized to view this resource. You need to login.” Um, ok; I’m not sure I care, but out of a sense of curiosity I actually created an account. Shouldn’t have bothered, because I’m still not authorized to view whatever the resource is. In fact, the only new thing I get access to for my troubles appears to be a ‘links’ section, and the only link goes to now-defunct The Dirt — oops! And what’s up with the weird techno styling? They designed this thing in 2006; why make it look like 2003? This is all a little disturbing — Category 305 is spending good money running ads on WLRN. They’ve got writers doing interesting work (check out the new Oriental market survey). They have someone photoshopping text over photos. They’ve got Rebecca Wakefield, for christsakes! But unless this website gets fixed dumped and redone from scratch, and I mean pronto, it ain’t going nowhere. Some cranky guy bemoans the death of traffic reports done live from helicopters. Possibly related: Forecast Advisor links to various online weather predictions, and more importantly, lists how accurate each one has been over the last month and year. This type of information should be available for TV station weather. And radio traffic reports! A lot of noise about online-only local “magazines” lately. Indi Live Mag was recently written up in New Times (is it me or do they really not give a link?? ), and is available for download as a PDF or ZIP (someone should tell them that a correctly done PDF is already compressed, so they’re doing nothing by zipping it except making headaches for anyone who doesn’t use WinXP). We also have Category 305, in a more web-readable format, which appears to be pretty nightlife-centered. Update: More information at a secret (?) New Times Blog post that Manola found. “Cessna Lands On U.S. 27 In Hialeah” LOLz .. quick, take a look at this before they yank it down in shame. 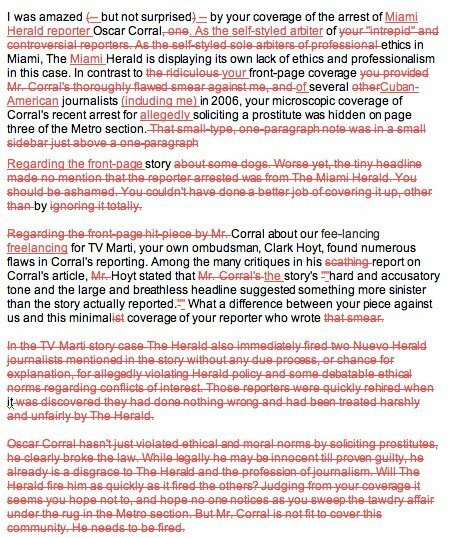 Also, Bob Norman looks into the commenting system at herald.com. Very interesting, though I don’t agree that the Herald is legally responsible for readers’ online comments: see Section 230 protections.